Let’s look at how we can display real-time and historical sensor data for Household Electrical usage using sqlDashboards. The historical data is taken from the UCI Machine Learning Repository. This is a single CSV file with 1 minute readings between December 2006 and November 2010. i.e. sub_metering_1: energy sub-metering No. 1 (in watt-hour of active energy). It corresponds to the kitchen, containing mainly a dishwasher, an oven and a microwave (hot plates are not electric but gas powered). sub_metering_2: energy sub-metering No. 2 (in watt-hour of active energy). It corresponds to the laundry room, containing a washing-machine, a tumble-drier, a refrigerator and a light. sub_metering_3: energy sub-metering No. 3 (in watt-hour of active energy). It corresponds to an electric water-heater and an air-conditioner. Imported the data to MySQL database. Created a java process to insert live sensor data. 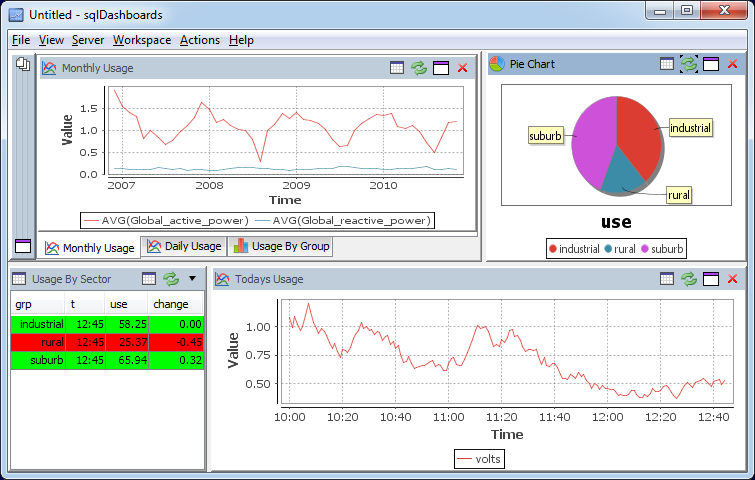 Tags: dashboard, mysql, sql, time-series.